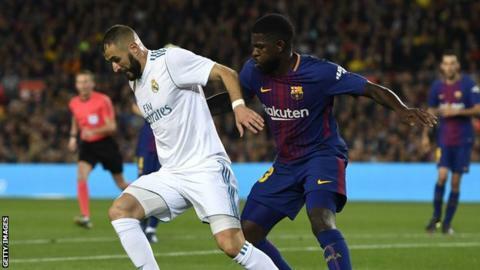 Barcelona centre-back Samuel Umtiti has agreed a new five-year deal with the Spanish champions until 2023, with a 500m euro (£437m) release clause. The France international, who scored the opening goal in his country's 3-1 victory over Italy on Friday, joined Barcelona from Lyon in 2016. Umtiti, 24, has since scored two goals in 88 appearances for Ernesto Valverde's side. In that time, he has won one La Liga title as well as two Copas del Rey.